Don’t let the time go! Invest in SIP now, and who knows it might turn out to be the biggest magic for you. In the era of techniques and innovations, we, the human beings, have become faster and smarter. Today, It’s no less than the magic that today we can even achieve the impossible. Due to the innovations in the information and technology sector an excellent growth has been witnessed in the past two decades that the expectations of the people have increased even for more. In this phase of competition where everyone wish to acquire the top position, people are more restless in chasing their goals. On the top of that they have many other goals in life which are to be attained successfully. Among all, one of the important is financial planning. But the majority of the people cannot effectively maintain their hobbies as per their financial plan. One of the most common things that happen with many of the them is That they put some amount in an insurance and after paying six to ten instalments, they forget about it. Four-five years later, they suddenly realise about that insurance, and they run again to get the benefits of the instalments which are already paid. It happens because of irregularity in managing the financial plans. What if you get a plan which can help you to reach your goals effectively at the same time you need not worry about paying the instalments, isn’t it awesome? Systematic Investment Plan (SIP) is a process through which you invest in the mutual funds methodologically and periodically. It helps you to achieve all your financial objectives in due time when you select the most appropriate scheme to invest in as per your investment objectives. Moreover, you also get the benefits of averaging down the risk from the market uncertainty. When you invest through SIP, you need not worry about the payment of the instalment amount because SIP has a feature which allows you to link your bank details to your investment. For this, you just need to fill in a debit mandate form which you can also complete online. After this, the instalments will automatically get debited from your bank account and get invested in the fund which you have selected. So, you can relax back on your sofa and need not panic about the investments; they will automatically be debited and invested to the SIP. You just need to wait for the time when it will accumulate to become a big corpus, and this way you will achieve your financial objectives. According to the table as mentioned above, you will be able to purchase a total of 520 units of the scheme at the end of the ten months through the way of SIP. On the other hand, if you would have invested through lumpsum, then you would have got to purchase only 500 units (1000*10/20). 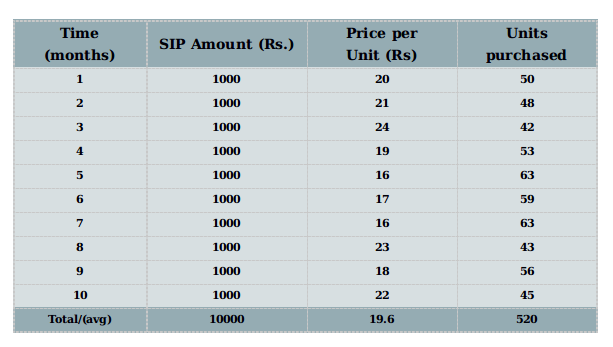 Therefore, here you get the benefit of having 20 extra units because you invested through SIP. In the above table, the figures are shown on the basis of the investment of Rs. 2000 monthly in SIP. When you continue to invest till the first five years, the total value of your investment grows to Rs. 1,20,000 and the future value stands around Rs. 1,79,363 (calculated on an expected rate of return of 15%). If you stay invested for more five years, then the benefits that you gain will be more than what you earned in the first five years. It is because of the compounding power. Similarly, each extra five years that you stay invested allows you to reap superior benefits to what you have earned in the previous tenure. Henceforth, the two main advantages of SIP as mentioned above are the reason for the traffic of investors in it. It has become one of the most favorite investment methods of the investors. It’s high time that you must also check how beneficial it stands for you. Start your investment today with our keen support at MySIPonline. We stand for you to provide you with the best online investment experience.